and my father got to see one and helped to make the other. After the massive trauma from his wicked fall led emergency brain surgery to relieve a brain bleed last saturday night. We will hopefully look back and see that he spent a mercifully short time in the SICU while his caregivers, children and close friends came together as one to provide the best care and hope for the best outcome. Tonight I know we did both. Every single one of his family played a vital role in helping Dad ease out of his pain and into the light. Last night, in between the raindrops and the late late night dark, we followed a small white van from the hospital through the deserted streets lined with palm trees and stucco walls and back down the long lane to the quiet back door of the hospice house. They settled him into the first room on the left and quickly and gently removed all but the essential palliative care. Pat took the recliner by his side and they wheeled a cot in for me and together we sat the vigil. His deep steady breaths were almost drowned out by the roaring of an air conditioner…almost. I kept pace all night with his rhythm listening for too long a pause. I might have slept but for the settling fears. After hours of phone calls to keep all the siblings up to date on the situation which seemed to change hourly, the roller coaster ride had come to an end and we were left to stand by as witnesses to the transition. When the dawn began to light up the dark and somber room I peeked out to see a small lake and some sweet green grass. i got up and walked the long empty corridor and wondered how well I would come to know the pattern in it’s carpet. I walked back to our room and woke Pat and we decided that since Dad had been stable for hours we might have a window of respite to go to his apartment refuel and regroup. I held his hand and told him that his plane was ready and the this time He gets to be the pilot and if he decided to fly away while I was gone it was A OK with me but to make sure to wave as he flew by. In a very short time we had picked up his ipad to bring him his music and the Whinnie the Pooh story I was reading him in the hospital, washed ourselves up and gathered our meds with the plan to stay by his side as long as needed. With our hand on the doorknob to leave the phone rang and it was the nurse telling us his breathing was irregular and we were there within 15 minutes. I wept with tears of sadness and joy and thanked him for the very great gift of not having to watch the sometimes gravely bits at the end…and the relief that his suffering was over. The first sign he was ok was the hand waving in the car driving into hospice as we were driving out…Bill Forbes was coming to visit not having heard. We hugged between the two cars and he made us follow him to get something to eat where Martha, his wife joined us and we wept and laughed and generally made our own little wake. The second sign was the magnificent display of clouds all day. When I left Dad the first time I made a note to tell him how different they were down here than in our hilly New England skies. Turns out he was painting them himself by the time I got back to him. This entire week’s journey has been surreal and often felt to me as if I was in someone else’s sitcom but coming home to his place this afternoon was a massive shift in the tectonic plates. What, this morning, was his property to be protected and privacy to be guarded was now three rooms full of orphaned treasures. 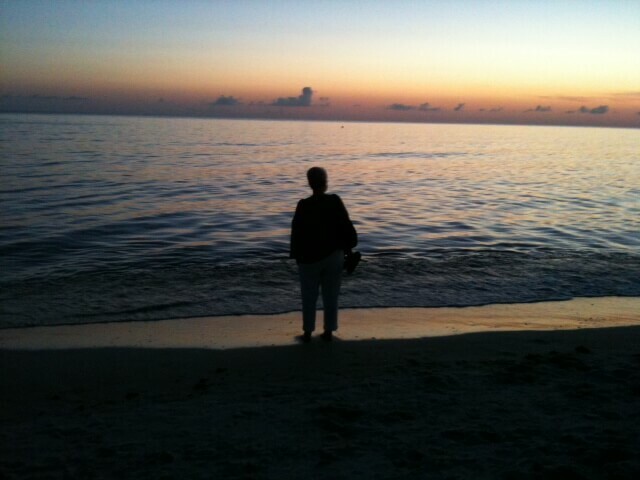 Martha shook us out of our dazed state of exhaustion and told us she had reserved a table at a restaurant by the beach and we were to go there and sit by the water and watch the legendary Sunset over Naples Bay. Honestly, when we pulled into the drive I was afraid they would suss out our log cabin roots and send us packing to dairy queen. But they couldn’t have been nicer and we were seated on the veranda just under the cover of the porch roof in case the magestic thunder clouds decided to let go. It was wonderful to be in a festive atmosphere as we had decided to celebrate Dad’s life and raise a toast to his last sunset. Just over my shoulder, as we were feasting on our shrimp cocktail, a small wedding party paraded down a rose petal strewn grassy aisle accompanied by chamber music and cameras flashing and dinner guests on the veranda raising their glasses in congratulations. Pat smiled and we toasted the long winding thread of life…going on and on. The waiter who poured our drinks said something nice and Pat put her arm on his and thanked him for making me smile telling him that my father had died this morning …his eyes filled up and he told us his mother had died two weeks ago…in jamaica. He was able to be there. A whisper. Then as the grilled scallops and ridiculously rich lobster sauce was served a vibrant woman with a notebook in hand, who turned out to be part concierge and part notary, came up and asked us if we were the two women in the newspaper article. Nope I don’t think so…Yes, yes the ones who have been together for 36 years ? We’ll give you twenty and hope for the next 16 but nope, we’re not from around here. She had trouble taking no for an answer but we got to talking and she went to find the article to show us and the merriment around us blossomed into a beach party complete with sparrows dancing at my feet and the entire crowd rearranging their chairs to get the best view of the sun which was setting behind Dad’s majestic clouds. 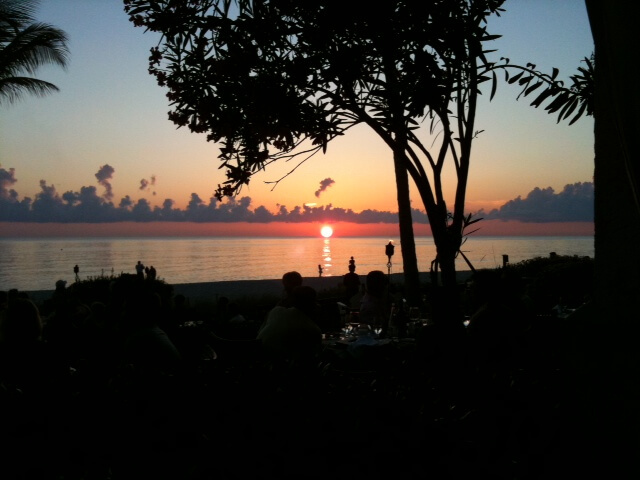 Bill swears by this famous green flash that happens just as the sun sets. I did hear others saying…wait…wait for it. 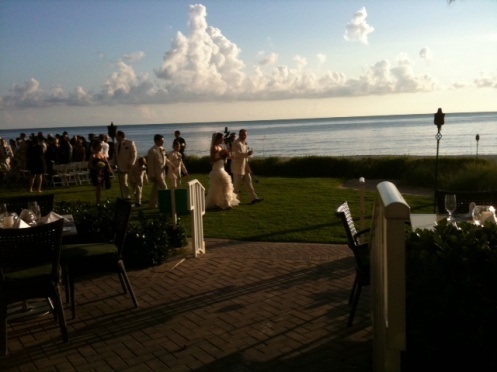 When at last it set a wave of applause rippled along the beach…some were disappointed. Not me. I was looking into Pat’s eyes, green as the dune grasses beyond and my heart was brimming with having come through this week of storms …out to the other side…where we all have found some new names for peace. Thanks for sharing your last sunrise with me Dad…and leaving your trail across all the sunsets to come. I’m headed to Florida tomorrow. My father is in a coma after brain surgery to relieve a subdural hematoma sustained in a fall. There are so many layers to this but the way my family has come together is nothing short of miraculous. My brothers and step sister and brother have gently and immediately fallen into a strong and loving support system. Coupled with the dear friends my father has in Naples and a caring and supportive church family he has down there…my Dad has a winning team behind him. The studio lights will be dark for the foreseeable future but my trusty apprentice will be guarding the paintings that are piling up for the summer shows. One of the best parts of having a gallery represent an artist’s work is the unexpected connections that the paintings can make with people you have never met. The Granary Gallery (scroll down to the bottom of this linked page to view a video of a summer art opening) on Martha’s Vineyard is in an old red barn in the center of the island and, with it’s unique low keyed old corner store gathering place kind of feel, it is a year round destination for everyone from tourists to school children. Whether you’re an art lover or just along for the ride there is something to catch just about everyone’s fancy. Occasionally I’ll hear from someone who has made their way there and come across my work. I love hearing the stories and links to their common ground. One such connection was made a while back with a woman who was pondering what to do with her need to create and we corresponded about where she was on that journey…ready to take a big step. Hi Heather – so happy to see you back online as I had been hoping all was well! Not sure if you remember, but I’m the woman from NH who left you a note at the Granary, telling you how much my son and I enjoyed your work. Since then I’ve been in touch a few times via email – telling you about my own journey; pursuing illustration for children’s books. Early next month I’ll be recieving my certificate from RISD in Children’s Book Illustration (after a looong 3 years! ), but I want to tell you THANK YOU. You had written a bit on month about Great Women Artists, what it takes to be a woman, and the challenges of focus, and time, and being selfish. To make a long story short, I took my small talents, and made a dedicated place for me to work (my studio instead of my dining room table), and among other small changes I became “selfish” with my time, taking my time and focusing, and felt good about it. 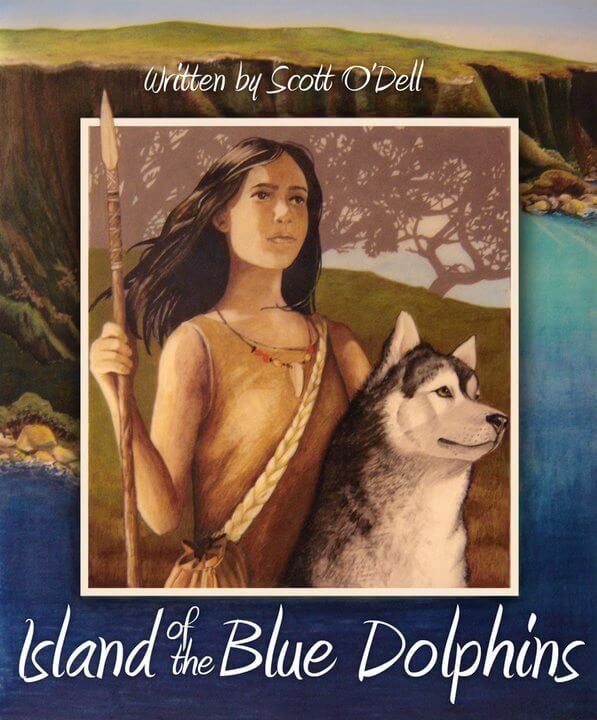 The results of these changes were my increased happiness and confidence in my work – but the results were also validated this weekend at the New England Regional Society of Children’s Book Writers and Illustrators Conference – were I took home 3rd place in the published division for my Book Cover Illustration for “Island od Blyue Dolphins”. I am THRILLED – and I owe you a huge thank you for helping me to see. OK I’m back… if only for what was supposed to be a quick entry and has now taken me two hours just to sort through some photos for ya. I have begun to get emails and inquiries from some of you who have been worried about my blog absence…along with some not so gentle nudges for updates and more photos…I am heartily sorry and phenomenally busy. More that the usual crazy around here but we are all well and, as you will see in the pics here…just plain plowing through the spring. With a very few exceptions I have been painting non-stop getting ready for the big Granary show this summer and a June show at Gallery 1261 and a special exhibition in Santa Fe in July ! I promise to fill you in on all of those very soon. The Lake Placid Lackeys came for an extended visit that spanned the entire month of April and right on into May. Jon was working on a stunning stone project in lancaster and commuted from our place while Zoe and her mom Tonya hung out with Gran and Mima. When T went back home to her teaching gig Zoe took over grandma sitting and we worked in the garden and built a new arbor with raised beds for some more veggies and herbs and a grapevine. I gave Zoe her first woodworking lesson at the shaving horse. And she got her very first taste of Reeser’s ice cream ! On the back end of that trip we spent my favorite day of the year at the Sheep and Wool Festival. It was one of my all time highlights to introduced Zoe to this event and except for one very big and loud Baaaaaahhhh…she had a blast. Now it is mid May and the northern visitors have left and all that rain, the wettest April on record, has indeed brought the most beautiful May flowers I can remember. The beach rose which I brought back as a tiny seedling from the island is in full bloom and her scent carries me back to the bluff every morning when I come over to the studio yard to begin the day. A loving couple of bluebirds has taken up residence in the blue birdhouse in the studio garden and all day long they flit around perching on the tops of shovels and dogwood branches and they have christened the new arbor as their very own sky box for a view of our comings and goings. Herself and Finnegan have developed a daily walking routine that is getting them both in fabulous shape and they are unchaining my ankles from the easel for a couple hours on the sunny days to let me work in the garden which is helping me to deal with pre-show stresses. Frames and professional photographs are starting to come in for the finished paintings and the studio is a beehive of activity. Look for previews here soon and details on all the upcoming shows. So our spring has been bookended with time spent with the oldest and the youngest grandchild…doesn’t get any better than that.